Cutting-edge arrangements, tight vocal percussion and spirited harmonies are just some of the phrases used to describe Nashville based vocal group Breath of Soul. Since 2006, the group has brought their unique a cappella tunes to festival, concert, and church audiences throughout the United States and abroad. 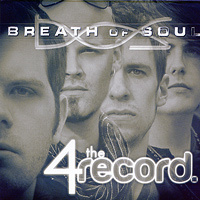 Before their relocation from the midwest to Nashville, TN, Breath of Soul was formerly titled 5one - so named for the familiar music cadence, V-I. The group originated at Millikin University in Decatur, IL and three of the five founding members of 5one still perform with the group today. Breath of Soul, David, Jesse, Tony and Jake, is an all-male a cappella contemporary quartet who bill themselves as "Nashville's Premier Vocal Band." "4 the record" is their 3rd album, following 2009's "Blue Christmas" and 2010's "Breath of Soul," to which we gave rave reviews on the Primarily A Cappella website, commenting, "to be this good early in their careers promises great things for BOS." "4" is the poised, finely-crafted album of a mature group who have paid their dues and are ready to join a handful of cappella's elite groups. Some of our favorites among the 10 cuts are beautifully arranged covers of Foster the People's "Pumped Up Kicks," Lady GaGa's "Bad Romance," a fine pair of originals by tenor & vocal percussionist Jake, "Bee" and "Give Yourself;" The Animals' "House of the Rising Sun," excellent takes on a pair by Cory Hosler, "Fix You, Fix Me" and "My Last Season;" an impressive, sweetly-segueing medley of "Michael Jackson vs. Queen," Adele's "Rollin' in the Deep," and a soulful, harmonic take on Jason Mraz's romantic anthem "I Won't Give Up." 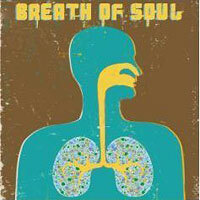 Don't miss this one--Breath of Soul is smokin' hot and "4" took our breath away! 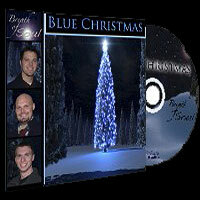 "Nashville's Premier Vocal Band," Breath of Soul, David, Jesse, Tony and Jake, brings us what seems to be their first recording as a trio (vocal percussionist Jake is not pictured on the cover, and there are no liner notes) a surprising, thought-provoking 8-song Christmas CD, recorded in 2009. For singing together only a few years, BOS sounds like a much more experienced group. We're especially impressed with their cutting-edge arrangement, most probably done by baritone Jesse Upah, who did all the arranging on BOS's excellent 2010 release "Breath of Soul." "O Come O Come Emmanuel" is a bluenote, call-and-response arrangement of the classic carol unlike any we've ever heard, "Satisfaction" is a vocal percussion-driven original with a memorable hook, "Peace, love, hope, satisfaction! ;" the title tune is a Doo-Woppy walking Blues with a sweet whistle solo, "Silver Bells" also has a walking-rhythm Doo-Wop flavor with sweet leads and harmonies, and "Angels We Have Heard on High" is given a nice 80s pop rearrangement with a cool lead that eventually dances its way back to the original chorus tune. "Rudolph" has a jazzy, 50s nightclub flavor, a fairly standard "Silent Night" shows off BOS's considerable harmonic blending talents as it segues into a gentle "Away in A Manger" and the powerful "I Heard the Bells on Christmas Day" gets a new melody and new words ("Then ring the Bells so loud and deep, God is not dead, nor does He sleep, peace on earth, goodwill to men!"). Breath of Soul, which we would classify as "Contemporary Christian" on "Blue Christmas," has taken a lot of chances here, while showing off its collection of non-instrumental sounds and whistles, technical augmentations, and of course, yummy leads and harmonies. And it all shows us a group that we feel is destined for great things! David, Jesse, Tony and Jake of "Nashville's Premier Vocal Band" Breath of Soul bring us their impressive, soulful, self-titled debut CD, recorded in 2010. Singing together for just a few years, these four friends have the talent, poise, harmonies, leads and arrangements of a group with years more experience. All 13 songs were arranged by BOS baritone Jesse Upah, who wrote the short, sweet "It's Just An Intro," "Breath of Soul" and "To Be Continued" mixes a lot of fresh sounds like the faux kazoo on Lennon/McCartney's "Come Together" and the fiery, powerful vocal percussion on "Lost!," the digital wah-wah effects and rap talk on "Breath of Soul," gentle finger-snapping on the gentle "Nora," chirpy Doo-Woppy notes on R. Spektor's "On The Radio," butter-creamy harmonies on "The Doxology," deep-bass percussion on the inspirational "Freedom Song," crazed popcorn and funhouse rhythms on Neal Diamond's "Headed for the Future," Stephen Foster's still-relevant "Hard Times," S. Chapman's driving "Lord of the Dance," and a sweet, creepy take on Stevie Wonder's hit "Superstition." Every cut here is a finely crafted winner, as BOS shows off its impressive collection of non-instrumental sounds, yummy leads and harmonies. To be this good this early in their careers promises great things for Breath of Soul!